Drug form: Solution for external use. Description: Strong spicy taste, red transparent liquid with eucalyptus and menthol characteristic smell.Existance of sediment is permitted. Pharmacological operation: “Neoarthri” is characterized with local irritating, anti-inflammatory, spasmolytics, antiseptic, painkilling action. Pharmacological activity of the preparation is conditioned with irritating effect of skin receptors by its compounding components, which causes reflex phenomena. Pepper tincture contains complex of biologicaly active substances, mainly alkaloid capsicum, which determines local irritating effect of the preparation and its applying on the healthy skin surface causes feeling of warmth. Menthol stimulates cold receptors and reduces pain. The initial sensation of cold is soon replaced by a sensation of warmth. Eucalyptus oil has a local irritating and moderate anti- inflammatory effect. Indication: Arthritis, plexitis, radiculitis, myositis, myalgia, tendovaginitis. Contra indication: Hypersensitivity to the components within the drug. Warning: Usage of the drug is contraindicated in case of violations of the skin surface! Side-effects: Allergic reactions are possible. At the time of additional sensitivity towards the menthol, there may develop rash, contact dermatitis. Using rule and dosage: Grease it on the painful part of the skin 2-3 times a day. Wrap up warmly after greasing. Overdose: No cases of overdose have been recorded. 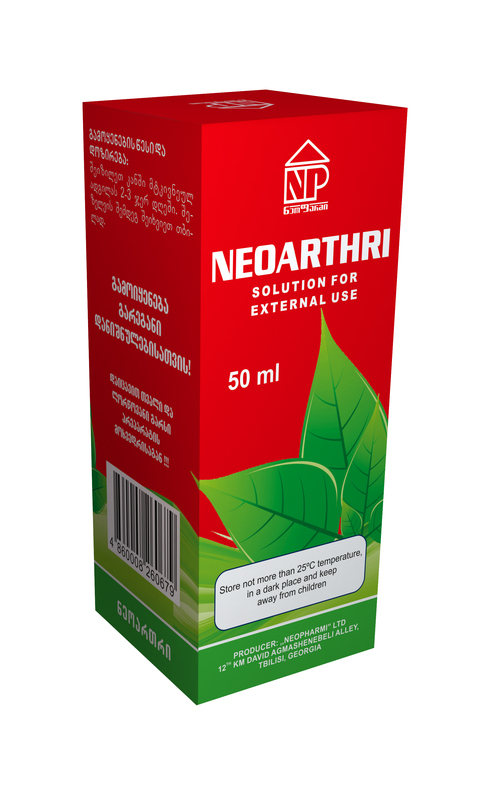 Pregnancy and lactation: Usage of “Neoarthri” is permitted during pregnancy and lactation period. The preparation does not operate on ability of driving motor transport and mechanisms. Primary package: 50ml solution in bottles of dark orange glass or polymeric material. Secondary packaging: The bottle is placed in a cardboard box with instruction and polimeric gloves. Storage conditions: Store not more than 250C temperature, in a dark place and keep away from children. Order of issue: The third group of pharmaceutical product – issued without prescription.